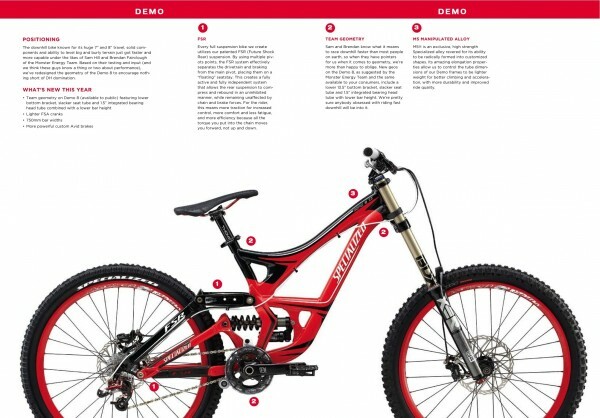 Rather than go on about the new bike range from Specialized, we thought we’d show you the whole press-kit. Then you’ll know as much as we do. 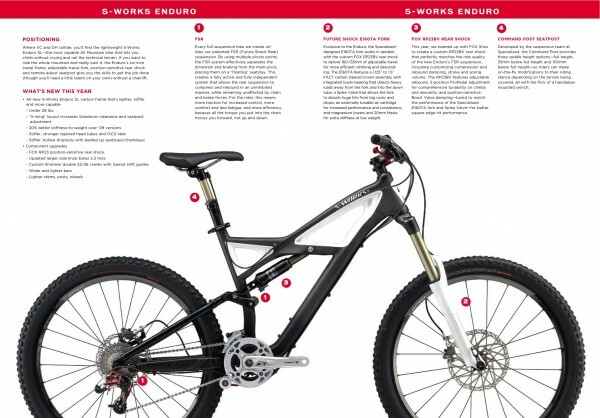 The new S-Works Enduro also features the horizontal Epic-style rear shock (with new RP23BV from Fox. The Future Shock E160TA up front delivers 135-160mm of travel). The bike also comes with a Specialized Command Post seat dropper as standard. ISCG mounts are fitted and they reckon it comes in under 28lbs. 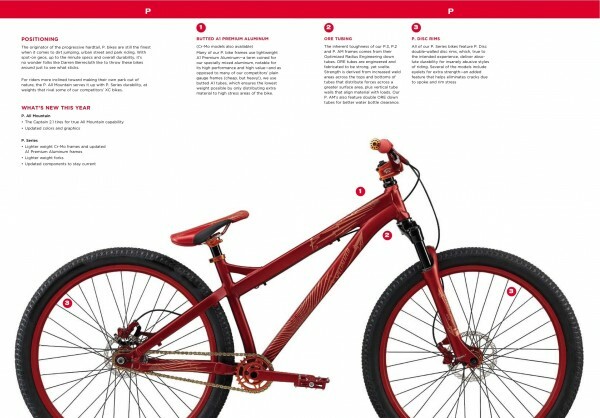 The Specialized 'P' jump bike. About as Marmite as you're going to get, we reckon. Thumbs up or down? 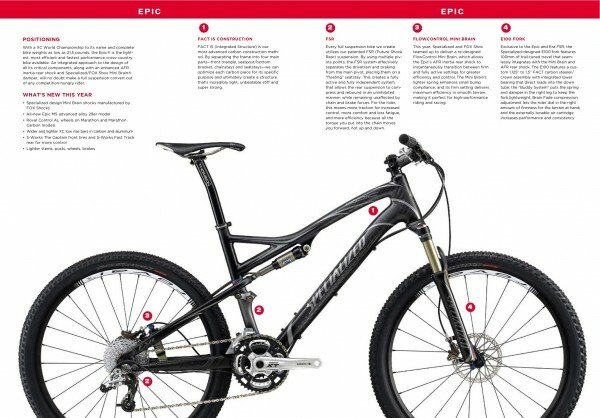 We loved the Specialized Epic Marthon in issue 50 of Singletrack and this model looks like it'll keep our affections. 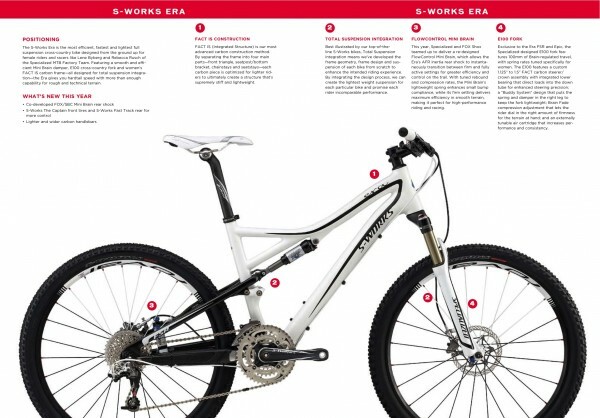 Not too much has changed except that the rear shock is now made by Fox again, there's an alloy 29er model for those who want it, Roval wheels on Marathon and Marathon Carbon and wider and lighter XC low rise bars. We like. 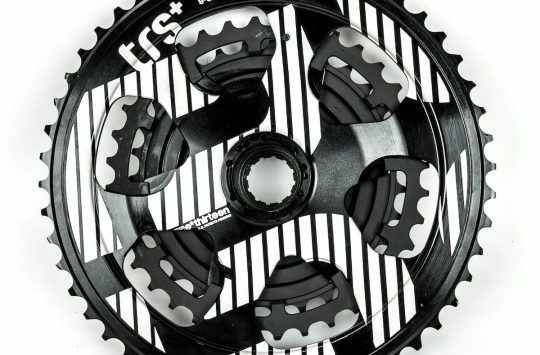 As raced, launched, crashed and zoomed around on by Sam Hill and Brendan Fairclough, the Demo 8 features 'team geometry' with a lower (13.5in) BB, slacker seat tube and a 1.5in integrated bearing headset for low stack height. A wide (but not Sam Hill wide) 750mm bar rounds out the cockpit. Oh, and the Pitch, which we reckon is one of the best value for money bikes out there is near-enough unchanged for 2010. Yay! If you're American, you probably love it and we'll have to admit it's one of the more attractive 29ers we've seen this year. 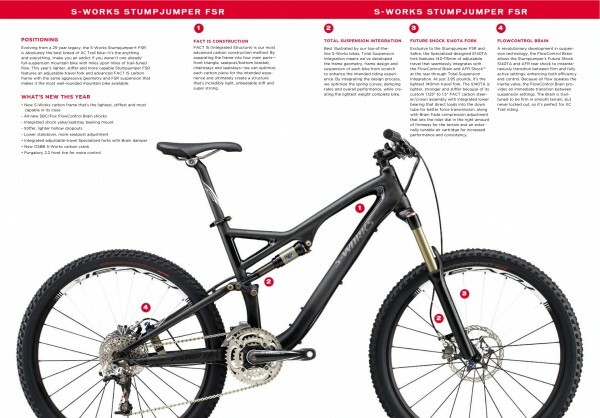 The S-Works Carbon 29er frame is 1.15kg and the bike comes with OSBB Carbon cranks and new Roval Control 29 wheels, with a Reba S29 carbon fork up front that uses a custom carbon tapered crown/steerer from Spesh. Specialized are finally making sure that the bikes in their women's range look as good as the men's bikes. No more girly graphics - these new bikes are visually strong and look like they'll be a blast to ride. This S-Works Safire features the new E140TA fork with 115-140mm travel adjust with carbon steerer/crown as well as the Flowcontrol Brain out back. With a shorter, higher cockpit, we reckon this'll be a big hit. Just click the link and you’ll be taken to a page where you can flip through the Media Pack and zoom in. There. 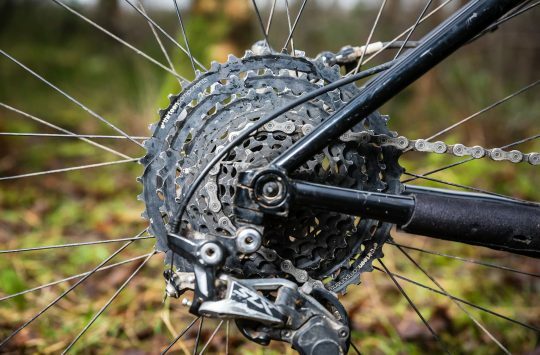 You now know more than your local Specialized Dealer. That bike is very red! Any news on a new Pitch? Stumpy HT 29er = oooh. fast. 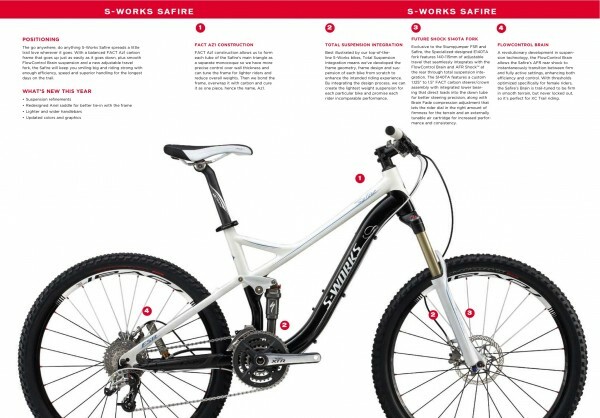 saffire = nice girls bikes. pitch = unchanged – yay! pitch for me good sir! 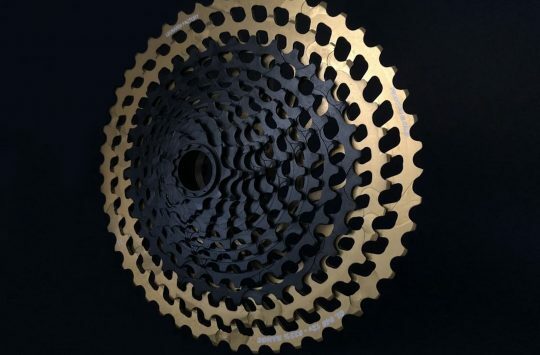 any news on the LTD edition singlespeed carbon 29er? It fell in a micro-niche and hasn’t been seen since. 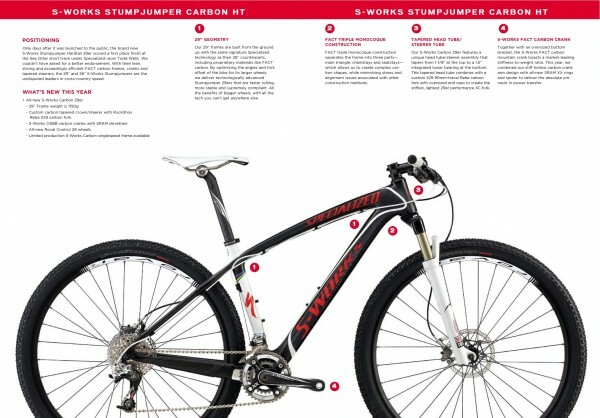 Is the stumpy only avaailable in carbon this year then? I think I hear this model is about 4500 quid. The frame needs a unique fork with tapered headstock. Only a 9mm QR and not QR15! allyharp – Try reading the article! So you haven’t read the bit at the bottom and clicked on the link to open up the entire Media pack in a zoomable flashy format then? S-Works Stumpy Carbon HT looks bloomin’ fast just standing still! Silly weight for the frame too. Bet this puts the proverbial cat amongst the pigeons not just in the mainstream mountain biking community who view Spec’ as almost the dependable bedrock of modern biking manufacturing but amongst those journos who have yet to fully comprehend the true nature of 29ers (I keep having such moments of absolute clarity on my 29er, some 6 months into ownership, that I could well sell all my 26ers).